Once the challenge photo was done I crossed the road to the fantastic St Mary Latton church. I've taken some shots of the church before, but not for a long while, and as I was so close it seemed silly not to go and play! 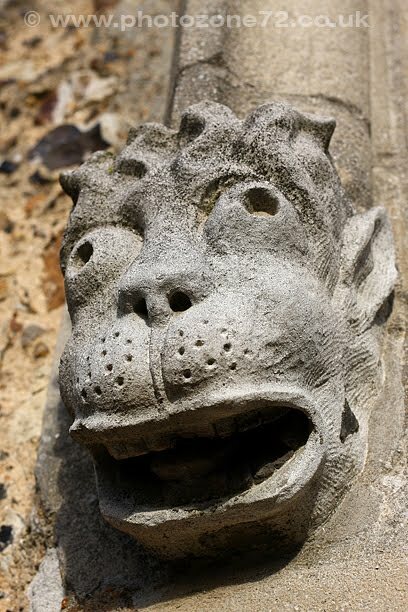 Some more shots will probably appear in due course, but for now, this gargoyle-type creature is one of a pair to be found either side of the main entrance door in the base of the tower. A quick bit of history - there has been a church of some sort on the site since at least 900AD, and the main part of the current church is known to have been built in 1087 by the Normans. The Square tower was added in the 16th century, replacing the previous round one, but utilising some of the materials from the old one, including some Roman bricks which can still be seen at the base of the tower. From the early 1920's the numbers in the parish declined drastically and the church gradually fell into disuse, until in 1950 a group of people got together with the intention of reopening and restoring the now derelict church, which was re-consecrated in October of that year. It is a fascinating building, both inside and out, and my thanks go to the verger (I presume) who arrived whilst I was happily strolling around the outside and asked if I would like to see the inside as well - I did! He also furnished me with a fascinating booklet from which the above history has largely been taken. This picture illustrates nicely a subject I have touched on before - that of houses getting abandoned as families "upgrade" to the next step on the property ladder. 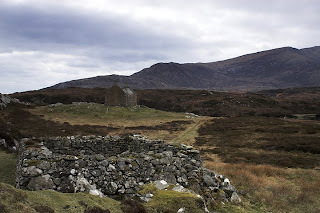 In the foreground just the walls remain of the original blackhouse, whilst beyond that the whitehouse has lost its roof, but a lot of the internal features were still in place. Where these people moved to we have no way of knowing - due to the lack of road access this entire area was dotted with these ruins as people had moved to somewhere more accessible. There is even an old school left to ruins - fascinating stuff. We've now reached the time of year when thoughts start to turn more and more to our next trip up - lists have started being prepared, new camera memory cards ordered, and a reminder has flashed up on my iPhone this evening that we have to pay the cottage deposit quite soon. Ferry tickets will also need booking - although with only the one operator (Calmac) running ferries to the islands this is the only time in the year I book travel without shopping around for a better price! Our intention is that, as last year, we will travel across from Mallaig on the Scottish mainland to Armadale on Skye on the ferry - slightly more expensive but far more fun than driving all the way around the road - we will after all see Eilean Donan Castle (or Eileen's Doughnut as friends of ours always refer to it!) on the way back, and the ferry ride really feels like we have started the holiday proper even sooner! I've been looking for a photo to post for a few days now. I was hoping, by now, to have another one from our Photo Challenge as mentioned in a previous post, to use, but although we have our theme (Reflection) and I know exactly the shot I want to take for it, so far the light hasn't been right. Well, it's quite a demanding subject is "reflection"! So, today, with a spirit of "I will post a damned photo today.....grrr!" 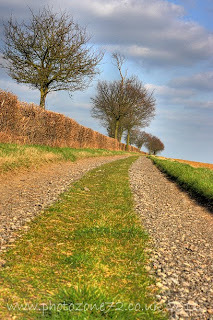 I started browsing through shots on the hard drive, and, tucked away in a folder called "Essex Walk" was the shot above. I'd had a go at processing it once before by the look of it, but obviously it hadn't quite gone to plan as I'd never finished the job. This attempt however I am happy with - a touch of HDR processing via the excellent Photomatix programme seemed to be the obvious choice for a shot with such naturally rich colours.